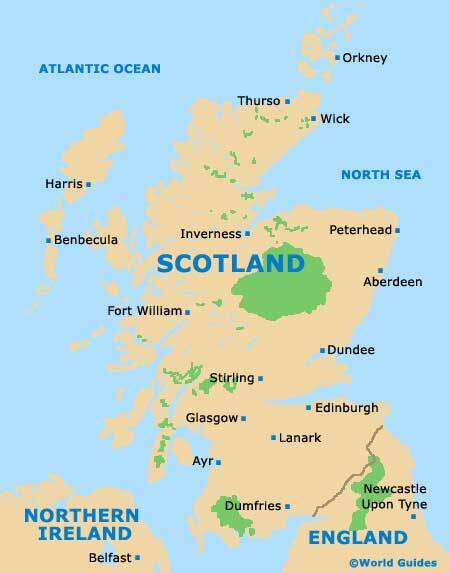 Scotland lies to the north of England and is the northernmost part of the United Kingdom. Numerous islands lie to the north and west coasts of Scotland such as the Shetlands, the Hebrides and the Orkneys. To the east of Scotland is the North Sea and to the west and north of Scotland lies the Atlantic Ocean. There is a long and rich Scottish history including barbaric tribes - such as the Picts and Scots; a long line of kings and queens and numerous battles. Tourists to Scotland will enjoy the wealth of historic places to visit that include Edinburgh Castle, Edinburgh Craigmillar Castle, Tantallon Castle, Inchcolm Abbey, Melrose Abbey and Stirling Castle. Other places of interest include Edinburgh - Scotland's impressive capital city that is steeped in history; and Glasgow - with many museums, landmarks and top-quality shopping. Scotland has a wealth of accommodation to suit all travellers including budget lodging, travel lodges, bed and breakfast and luxury hotels. Places to visit in Scotland include beaches, national parks, sporting venues, walking trails, mountaineering, museums, landmarks, monuments, festivals, carnivals, breathtaking scenery and quality shopping. Scotland is famous for the production of whisky and many distilleries include regular guided tours and malt whisky tastings. Standing on the eastern coastline of Scotland, Aberdeen has gained much wealth since oil was discovered in the adjacent North Sea during the 1970s. Old Aberdeen and the nearby Scottish Highlands provide much of the appeal. The port city of Dundee is to be found lying alongside the Firth of Tay. Dundee's lengthy shipbuilding heritage is celebrated today, with the three-masted RRS Discovery being a major attraction within the city's harbour. Edinburgh, Scotland's impressive capital city, enjoys a particularly scenic location, surrounded by volcanic hills on the southern edge of the Firth of Forth. On the east coast of Edinburgh is Portobello and to the north is the Firth of Forth. Glasgow is Scotland's largest city and has a strong industrial past. Famous for its reinvention and transformation, Glasgow is also the second largest retail shopping centre in the whole of the United Kingdom, with many hundreds of independently owned stores. Capital of the Highlands, Inverness serves as a busy seaport next to the Great Glen area. Thousands of tourists pass through Inverness each year on their way to nearby Loch Ness, all hoping to catch a glimpse of the loch's mysterious monster, Nessie. An especially engaging Scottish city, Stirling has grown up around the Forth River and is regularly referred to as the 'Gateway to the Highlands'. The Old Town, Stirling Castle and the National Wallace Monument are all notable highlights.